You are currently browsing the tag archive for the ‘busy!’ tag. This week is showing me who’s boss, and I’ll tell you, the boss is not me. I am sitting at work, thinking about the days to come in my head, and trying to plan a dinner where I can use many of the ingredients that are sitting in my fridge, just waiting to be made into something delicious. Tomorrow? Nope, gotta use the Groupon that’s about to expire. Saturday? Nope, we’ll be rushing to a hockey game from our all-afternoon church activity, so that will probably mean hotdogs and beers. Sunday? …Maybe? But I have a recording session all afternoon and I’m at this point just expecting to grab food with the guys at the studio and call it a night. It’s not that I’m complaining about all the beautiful events that are taking place this week. It’s just that I feel like I need a few days to rest in between. You know? So I don’t contract all the diseases the college kids at my job are inevitably trying to give me. So, I’m wiped. But at least work isn’t crazy. What’s got you wiped out today? I enjoy it, even if no one else does. 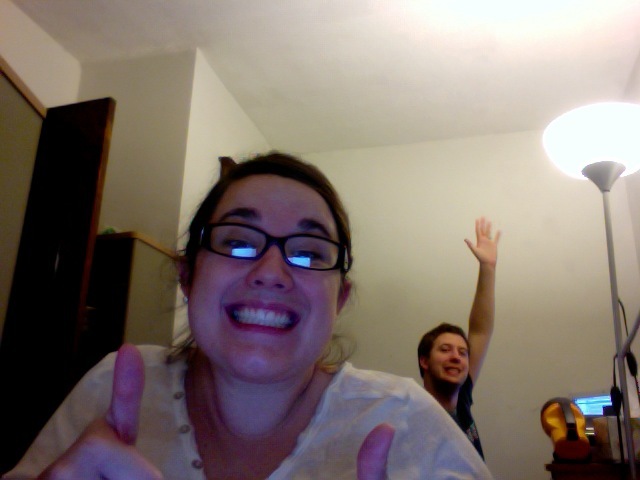 We’ve been doing computery things all evening, and I got into my pajamas today at 8:15! It was glorious. If it seems like we have nothing to do, we are fooling you. But an 8:15 pajama time? It was like a gift. If you’re reading this, I hope your day has been lovely. You look great today. Holy macaroni, I’ve been busy lately. Last week I worked about 50 hours–half of that in only two days–and spent my one day of weekend trying to recuperate enough to get myself out of bed Monday morning. Almost as a relief, I caught whatever cold Elliot had this week, and spent some days at home, doing laundry. It forced me to slow down, which was a blessing. What is the balance? I seem not to have found it yet, at this point in my still-young life. I am working, I am cooking, I am cleaning, I am driving, serving, sleeping, kissing, baking, sitting, finally breathing…I am running. I am wasting time. I have little time to waste. I have so much time. Abrupt end to this rambling post: It only takes me starting a sort of catch-up post when I remember what it is I’ve been meaning to write about, yet I never have the heart to trash the first one. More words coming soon.